This surprised me - it really was very good. Scented very lightly (and the smell fades almost immediately) with a slightly almond scent, this is a light cream formulation and is designed for maturing skins. I used it for two weeks (courtesy of a huge bunch of free samples from the kind MB SA I encountered while in Belfast recently - reviews of the cleanser and toner will follow soon). My skin, at the moment, is well and truly over its oilier state of the summer months. Thanks to not just one but four illnesses back-to-back (nice, eh! ), it's in rag order - dry, stressed, unhappy, flaky. This helped to actually de-stress and nourish my skin back to health - interestingly, with no serum to help it along, as I'd forgotten to bring my beloved Chanel Trio or any other skincare down home with me for the few days I was away. So, this is an impressive claim to fame. This is targeting early mature and dry skin types; featuring creole grass to help with firming. And my skin definitely felt firmer after a weeks' usage. So it would seem to do what it claims. 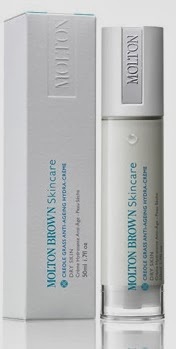 Molton Brown has other ranges for other skin types and their sales assistants are usually quite decent about handing out samples - so try before you buy - but if the other ranges live up to their promises in the same way as this range, then they're worth a try. Price-wise this isn't cheap though, I noticed it was around the €79 mark for 50ml... expensive enough therefore. Ingredients-wise, this is water-based with silicones listed next, glycerin and some seed and flower oils and extracts, shea butter and hyaluronic acid.... all good things bar the silicones - it annoys me that they exist in a skincare product, and that they're listed so close to the top. If silicones don't bother you, and the price is ok, it seems like a pretty good purchase.